Give your children a flying start – enrol them today in our Queensland Government Approved Kindergarten Program. 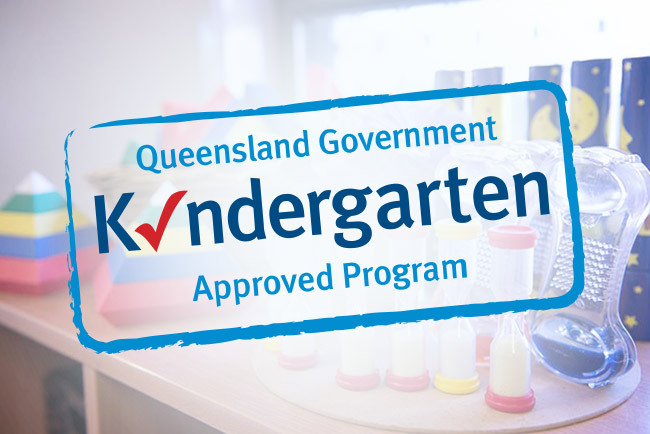 Our program has been officially approved by the Queensland Government; an assurance that our Kindergarten Program is delivered by a qualified Early Childhood Teacher. In Queensland, the Kindergarten Year is the year before the Preparatory Year of schooling. Throughout the Kindergarten Year, the focus is on the children’s rights and opportunity to experience the joy of childhood while promoting learning through play and emergent and planned learning experiences and interactions. We also focus on school readiness to ensure the children are confident, capable and ready for their transition to school. At Munchkins Early Education Centre we recognise that parents are the children’s first educators and value the vital role that parents, carers and family members play in the children’s lives and their ongoing learning and development. We encourage our families to be involved with our Kindergarten program and seek family and community involvement in our learning program on all levels and throughout the entire year. Our Kindergarten teachers educate within the Queensland Government and Queensland Skills Authority approved QKLG (Queensland Kindergarten Learning Guidelines) curriculum. This curriculum is based on the Early Years Learning Framework and embraces the inclusive vision that ‘all children experience learning that is engaging and builds success for life’. We encourage children to attend our Kindergarten program at least three days per week. We pride ourselves on the close relationships that we build with our families and take great care in making sure that both you and your children are comfortable with the settling in process. Book a tour today and we’ll give you a personal tour of our centre and facilities. Call our centre Director or drop in and see! Having been involved in education for the past 27 years, I feel very strongly about the value of the Early Years Sector and the importance of children learning in a warm, secure and encouraging environment. We value the long-term relationships that we have with our families and the local community; it is such a joy to share in your child’s journey and we take this role seriously. I look forward to meeting with you personally at the centre and introducing you to our amazing team. You are welcome to visit us at any time, view our exceptional programs in action and meet our quality educators. All Content Copyright © 2019 Munchkins Early Education Centre.